Successfully Added UHANS U300 Android Smartphone - 4G, Android 6.0, Octa Core CPU, 4GB RAM, 5.5 Inch FHD Display, IP65 Waterproof, 4750mAh Battery to your Shopping Cart. The UHANS U300 has a leather and metal design that is a refreshing change and brings an air of style and elegance to this Smartphone's appearance. This makes the UHANS fairly unique in the Smartphone market and it is certainly a phone that stands out from the crowd. With a splash-proof IP65 rating the UHANS U300 is a tough phone that can cope with the occasional downpour. The thick aluminum case means there is no flex and its strong enough to withstand the hazards of an active life. 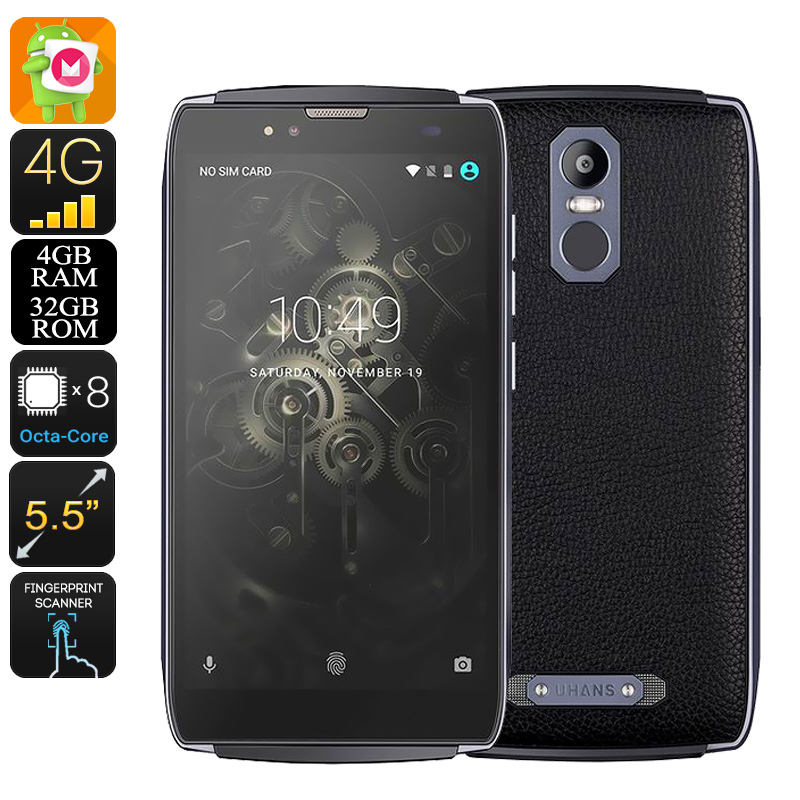 This 5.5 inch Smartphone has an Octa-core CPU clocked at 1.5GHz and with 4GB of RAM it has no problems running the latest apps or games. A full HD screen and Mali T860 GPU compliment this setup and brings bright, dazzling pictures with great color depth and richness for an enjoyable experience whether surfing the web, gaming or watching videos. You will have 32GB of storage space that can be extended by up to 128GB via the micro SD card so running out of space will never be a concern. Running on the Android 6.0 operating system this cell phone has access to the Google Play store and the wealth of apps and support that only Android can offer. There are two SIM card slots on the UHANS U300 mobile phone and each has access to 4G networks. This will let you manage two numbers from the one device and you'll be able to enjoy the superior coverage and cheaper call rates by avoiding roaming charges. Alliteratively manage all your business and leisure contacts effortlessly on the one device. With Wi-Fi, Bluetooth, OTG and GPS the UHANS U300 has everything you need, what's more, its massive 4750mAh battery will enough usage time to satisfy even the most demanding of users. The UHANS U300 Android Smartphone comes with a 12 months warranty, brought to you by the leader in electronic devices as well as wholesale Android Phones..